Spring is just around the corner and with the changing of the season comes the flourishing of the natural beauty of flowers blooming (both on trees and in the ground), warmer days, the sounds of children playing outside, and of course our desire to break the cabin fever and start enjoying the outdoors! What are the best ways to enjoy the outdoors at home? Well you’ve come to the right place to find out because we’ve got a variety of new items that will spruce up your front porch, back yard, or screened-in porch all throughout the day. Do you enjoy sipping tea or coffee as the sun rises? Do your friends gather at your place for lunch? How about outdoor dinner dining and a little entertaining afterwards? We have you covered to make your outdoor spaces appealing, functional, and low-maintenance! Another benefit to what we’re about to show you? These items are for both indoors and outdoors, so when that chill sets back in, just move your furniture inside and keep using it! While these fireplaces will add warmth to your space as the sun goes down, they are also awesome to look at! They will become the conversation piece of your gathering for sure. 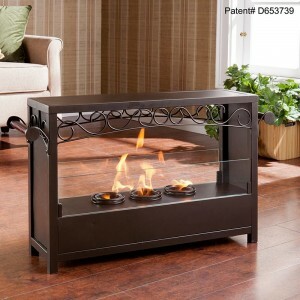 This portable gel fireplace offers the warmth and joys of a fireplace without wasting valuable space when not in use. FireGlo Gel Fuel snaps and crackles like real wood for the perfect fireplace experience; replace the gel fuel with decorative pillar candles for year round enjoyment. 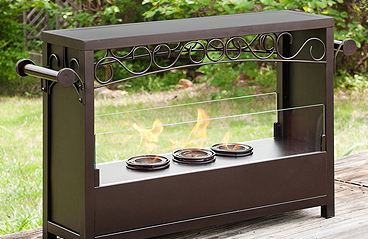 The patented handle design makes moving the fireplace a breeze. Where to put my drink or sunglasses? No matter how you’re enjoying your outdoor spaces, there’s always a need to set something down. Whether it’s a drink or your sunglasses, we’ve got you covered with a variety of colorful metal spiral accent tables! Designed with layers of wire and beautiful curves, this table is both functional and stylish. The round table surface is 14.75″ across, making it the perfect size for holding the essentials or decor without collecting clutter. All of these choices to spruce up your outdoor or indoor spaces are certainly not your only choices! Take a look at even more outdoor furniture options.